Any other work taking place and my personal thoughts in relation to the category will also be included. This week, a brainstorm on possible ways to promote the Analysis category and the potential difficulties in doing so. 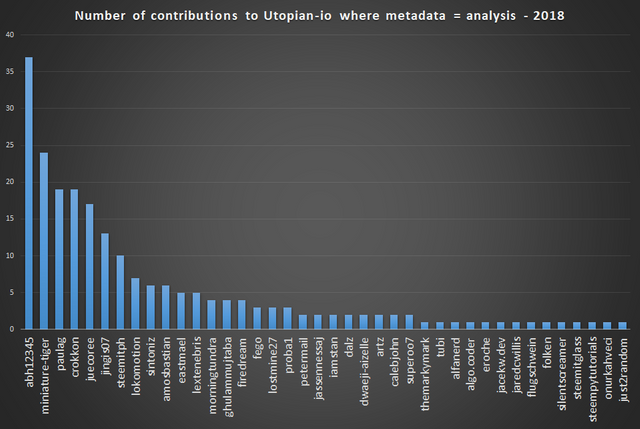 Previously, 'lostmine27' produced their first Analysis contribution to @utopian-io. The work received a low, manual score and the moderator left valuable feedback on the post. We are happy with this approach as this week, the contributor has submitted two Analysis contributions which have both scored much higher. 'Voting pattern - Posting to payout' confirmed suspicions that the majority of the votes for a post appear early - 50% of the votes by number within the first hour, and more than 80% in the first day. The moderator notes that it would be interesting to see how the votes come in by weight during the 7 day window. Since the SBD supply balance was very low in 2016 and 2017, our SBD was able to maintain a price well above US $ 1 with the boom in the cryptocurrency market. But now that SBD supply balance is not low and STEEM price is sluggish, it is not easy for SBD to maintain US $ 1. The SBD Debt Ratio is again threatened by the upper limit even though it has been less than two months since hard fork 20. The contribution was supported by 'blocktrades' which indicates there are top level eyes on this topic. In summary, the 4 contributions didn't reach the scores of recent weeks, but all deserve credit at individual pieces of work. Whilst the topics may be of particular interest to the areas of the community they cover, a fall in the average commentary on the posts could show lesser interest from the wider community. Although, it is also possible that the decline in the price of STEEM has reduced commentary across the platform in recent times. An average score of 71.5 this week is over 2 percent lower than the 8 week average of 73.8. 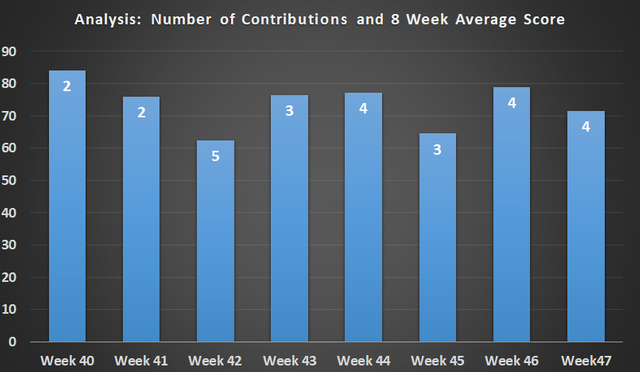 Four contributions is 0.62 higher than the 8 week average. 'paulag' still tops contributor table with 10 contributions over the past 8 weeks. 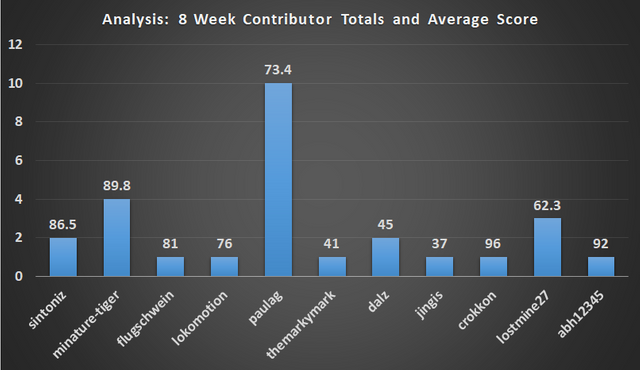 7 contributors have an average contribution score higher than 70 over the past 8 weeks. 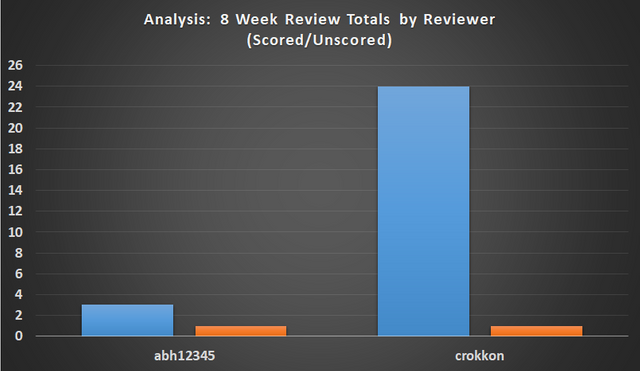 Two reviewers assessed all 27 contributions that received a score in the past 8 weeks. Both reviewers were unable to give a score to 1 contribution each. As community manager for the Analysis category at @utopian-io, I have an on-going task to try to grow the category by both on-boarding new contributors, and also trying to lure back previous contributors. It goes without saying that this is a difficult time for growth, anyway on the Steem blockchain, especially when we consider the current price of the STEEM token. Posts are down, comments are down, the rewards are down. However, there are still some options or ideas that could be used to promote and grow the number of weekly contributions to the category. So far I have the following, but if you are reading this post and have other ideas that may assist the growth of this (or any category), please leave a comment. This is likely the easiest option. However, I'm aware that the majority of my active followers know about @utopian-io due to my contributions and promotion of the application via text and video this year. I have been privately contacted by a couple of interested parties, one has contributed (with a good result), and one has not contributed yet. This is another option I have considered. Gather a list of this years contributors, check their scores, and check their activity on Steem. If they have scored well and are still active, it could be worth contacting them privately to ask a couple of questions regarding their inactivity with regards to Utopian. I don't this this will be taken negatively (depending on wording of course! ), and it could be that other categories may wish to take this approach also. If this is the case, then it might be an idea to structure a short, standard questionnaire in which we can gather information as to why they have stopped contributing to the category. In the chart below, we can see that there have been a total of 40 unique contributors to the Analysis category in 2018. 11 of these contributors have submitted work to @utopian-io in the past two months, and so it could be said that almost 75% of the unique contributors to @utopian-io this year are currently inactive. 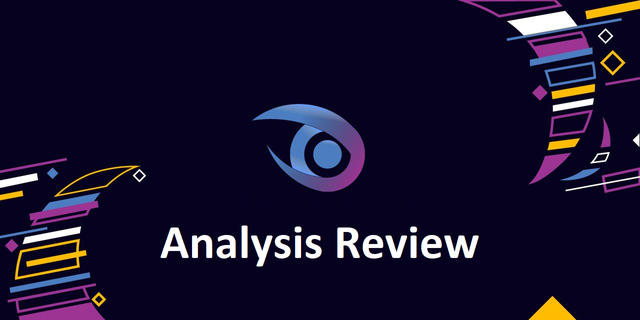 The Analysis category has long been thought of as one of the more difficult contribution areas to produce work for. Whilst I concede this is true in some respects (a basic/intermediate level of programming languages or analysis tools is a must), I think a large part of the analysis comes when thinking of 'what would be useful to the community, or an individual open source project. e.g. a wide enough scope), and turn it into a contribution to the Analysis category. if you have an idea that you would be interested to see the results of, please contact me in the comments, or on discord at abh12345 #9343. Could you change the other of the tags? iamutopian should precede the blog tag. Thank you! This is a fantastic report. It contains valuable information about the Analysis category. Well explained and well illustrated. As you've mentioned, I believe some category on utopian needs visibility. We need unique contributors that love to contribute to open source projects. Your ideas to grow the Analysis category are cool, and I hope it'll affect the category positively. I appreciate the effort you put in writing this report. Kudos! It's really tough to attract people at these prices, but we shall try. I was inspired by the friendly explanation. I think a large part of the analysis comes when thinking of 'what would be useful to the community, or an individual open source project. Thank you for your recent contributions, I found them both interesting, particularly the SBD debt. Very interesting analysis on the SBD Debt ratio as I myself started to experiment with conversions. Luckily I completed mine in time before the haircut gets worst so got over 1,000 SP for doing so after actually buying SBD from @blocktrades for a larger conversion. I look forward to see what will happen with this issue. Your UA account score is currently 6.750 which ranks you at #110 across all Steem accounts. Your rank has improved 1 places in the last three days (old rank 111). In our last Algorithmic Curation Round, consisting of 212 contributions, your post is ranked at #30.